The University of Tennessee athletic department is currently in full-on crisis mode thanks to the bungled hiring of Greg Schiano, and the apparent and baffling lack of vetting behind the decision-making process that led to that hiring. Not only is Schiano not going to be the next Volunteers coach, but there are now serious signs that Tennessee AD John Currie’s efforts to bring Schiano to town may soon cost him his job, too. The cluelessness with which Currie operated Sunday seems to be at the center of the matter. Whether or not hiring Schiano is a mistake in pure football terms is an abstract question, but not knowing that people would get pissed off at the prospect is a gross misread of his fanbase. Currie released a statement defending Schiano (“an outstanding leader”) and claiming that Tennessee carefully reviewed the testimony of Mike McQueary, though he didn’t give a reason for why the hire hadn’t gone through. As we began our search for our next head football coach earlier this month, I promised that I would pour all my energy and effort into this process. I have followed Coach Schiano’s accomplishments throughout his career and have been fortunate to get to know him and his family over the last several years. As reported by the media, he was a leading candidate for our position. Among the most respected professional and college football coaches, he is widely regarded as an outstanding leader who develops tough, competitive teams and cares deeply about his student-athletes. We carefully interviewed and vetted him, as we do candidates for all positions. He received the highest recommendations for character, family values and commitment to academic achievement and student-athlete welfare from his current and former athletics directors, players, coaching colleagues and experienced media figures. Coach Schiano worked at Penn State from 1990-1995. Consequently, we, of course, carefully reviewed the 2012 investigation report by Louis Freeh. Coach Schiano is not mentioned in the Freeh report and was not one of the more than 400 people interviewed in the investigation. We also confirmed that Coach Schiano was never deposed and never asked to testify in any criminal or civil matter. And, we conferred with our colleagues at The Ohio State University, who had conducted a similar inquiry after the 2016 release of testimony. I know that Coach Schiano will continue to have great success in his coaching career and wish him and his family well. 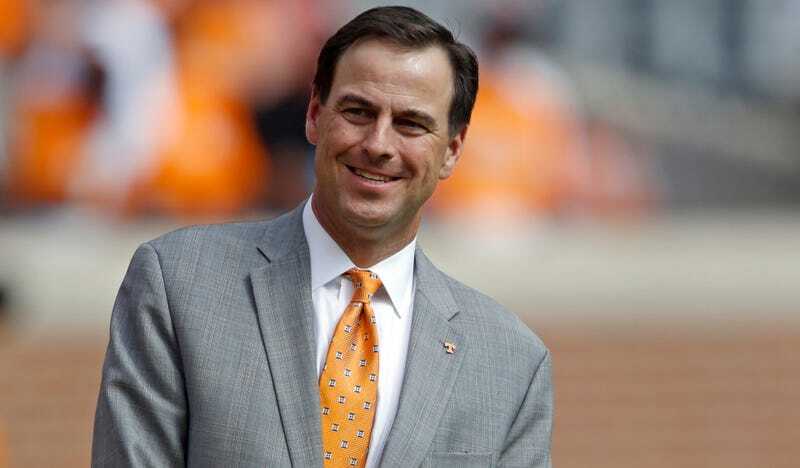 I am grateful for your patience as our search for the next leader for the Tennessee football program continues, and I look forward to making that introduction soon. Even though Tennessee is an SEC school of decent size, this whole mess probably knocks them a few pegs down on the list of desirable places to coach football. Getting rid of Currie might help that perception, although cutting him loose comes with the risk of making the program look even more chaotic (though hiring Tee Martin would be a positive step). It’s a no-win situation and Tennessee did it to themselves. Correction (1:50 p.m. ET): The report that Currie didn’t look at Schiano’s time at Penn State was erroneous, and we’ve removed a tweet indicating as much.